Deficiency is a rather young band from the Lorraine region in France. State Of Disillusion is the first album by the quartet which is mostly into modern thrash metal, but is also open to other influences. The Frenchmen show right away on the crunchy opener Brain Autopsy what they are all about. You get fast metal with bold riffs and a lot of breaks that recall the good, old Bay Area sound. But they also don’t neglect the melodic component, and especially the use of groovy parts gives the song even a more dynamic sound. The vocals are most of the time clean, but still have a lot of power. Occasionally the vocalist is growling, which also works very well. As most of their songs are between five and seven minutes long, the band takes care to add enough variety. At times they are even acting playfully, and sometimes even quite extreme. Especially the shortest track Neverending Fall, clocking in at just over four minutes, has a regular hectic feeling. There is also no lack of great guitar solos, which only adds to the overall quality. Towards the end, the album loses some of its pace, but again this doesn’t distract from the listening pleasure. Only the long instrumental Path To Nowhere seems a little too self-indulgent, as I get the impression that the band doesn’t really know what to do without vocals for this tracks eight minutes length. This is followed by Sight Of Despair, a true smasher that might as well have come from Metallica’s ...And Justice For All album. The last song, Too Weak To Fight, surprises with alternative elements, proving the band’s unpredictability. 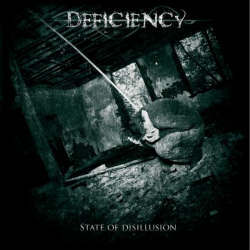 Somehow Deficiency remind me of Luxembourg thrash metal band Scarlet Anger, although they sound even more old-school. Deficiency offer a hefty mix of traditional and modern thrash metal, which especially trumps in the songwriting department. There hardly tread on any new ground, but still the musicians have enough potential and ideas to entertain throughout the generous length of over one hour. Let’s hope that these youngsters will get all the attention they deserve.